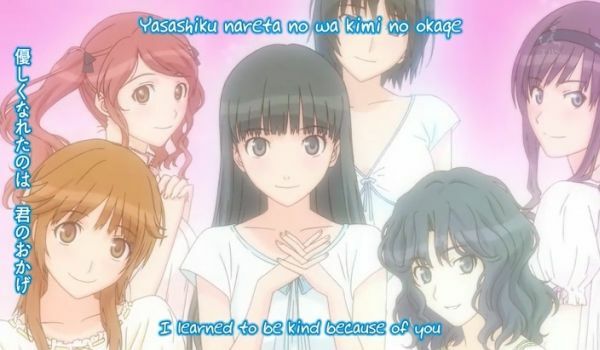 “I learned to be kind because of you.” That is how Unlimited Translation Works renders this line from the song “Kimi no mama de” (YouTube link). The line has also been translated as “I was able to be kind because of you”. So anyway, what have you learned or become able to do because of me? read my name, read my name! I’ve made a difference to the world. Chris has mentioned in at least three of his earlier songs a practice of going to the graveyards and reading the names on the headstones there. I get the impression that he considers this a kind of sacred act, as service perhaps both to those who lie beneath those stones and him who doesn’t yet. Because for each such name, there was someone whose life was just as important to them as our life is to us. Someone who dreamed, and tried to share those dreams. Where we are, they have been. Where they are, we shall be. They have been here, just read their names. I read an article on a Norwegian computer related web site the other day. It said that only a small part of the population used Twitter, and of those who did, only half actually read other people’s tweets. The other half were only interested in sending tweets, not reading them. My reaction was that this was probably better than in the flesh, where it seems the overwhelming majority are in love with their own voice, and will use most of the time when others speak to prepare their next “message”. In contrast, as I believe my brothers can attest, I rarely have anything to say when I converse with people lately. When they speak, I am listening to them, so I usually don’t have much of a rejoinder when they draw their breath. Yet even I have my “dance” that I wish to perform in front of the other bees, to tell them where I found my sweet flowers. This is the human condition, I think. (And that of worker bees, or so science says.) Â But what does it amount to, beyond “I have been here, read my name”? What is the difference I have made to the world? 2000 years ago, when Jesus Christ lived, there was some 200 to 300 million people in the world. A number of them are still known by name, but even your high school teacher would only know 20-30. To get up to 200-300 (one in a million), without resorting to specific books on the topic, you need a classical scholar. And even then, you don’t get much further. That is not to say that none of the rest made a difference to the world, a tiny and local difference. And due the “butterfly effect”, history might have been drastically different if one of them had made a different choice one day. But most of those lives kind of canceled out, like the waves of a raindrop hitting the sea on a rainy day. And then there was the depth charge that was Jesus Christ, who set off a tsunami that is still making waves 2000 years later. But how many would have followed his twitter in the year 25, compared to any other random raindrop? Not so much comparing myself to the incarnate sky-god here, as just reflecting on the scope of things, and how hard it is to say who we are until we are forgotten and only the work we did remains. Someone else’s theory, put quite simply, is this: The Savior is the light of the great saints. The great saint is the light of the other saints. The saint is the light of the heroes. The hero is the light of the good people. The good is the light of the world. -Details may vary, but in the old days, hierarchy was considered natural, and most thinking people would recognize the expression “the great chain of Being” even if they had not heard it before. Today, we have democracy, and those who vote depending on the color of someone’s necktie have as much influence as you. Or that is the theory. But it is not quite like that. Well, it may be in elections, but most elections are much less important than people believe. If random people elect other random people, the result will not rise above randomness. And if you cannot rule your own home with wisdom, let us not mention your own body, what will you achieve even if you rise to power or fame? Randomness. Some poor forgotten widow whose feeble life has a single direction will accomplish far more. This entry was posted in autobiography, history, human mind, music, philosophy by itlandm. Bookmark the permalink. When I walk, I like to walk in the cemetery. Cemeteries are basically laid out on a grid, with straight paths/roads kept clear of weeds. I also like to see the names and dates on them, noting historically when there were hard times, such as epidemics or wars. The frequency of various names can also tell a lot about a community, of course. The religious (and non-religious, sometimes) art and/or symbolism on the stones is also interesting. But, really, it seems like a friendly thing to do. Silly, yes? But just the realization that the people there were real, just like me, makes me wonder about their loves and hates, hopes and fears. I wish there were more recorded histories of the lives of ordinary people. I suppose it is somewhat nosy of me, but . . . I’m also the one who always went to my grandparents and asked for stories of their lives even as a child. It seemed necessary that someone remember such things! And now I’ve forgotten most of my own information, much less that gleaned from my family members! Of course, I was the same myself, asking my mother to tell me about her childhood rather than read fairy tales for me when I was little. Or so she has told me. I remember nothing of it. But then this was before the age where learning is different from life, so more or less of it may be part of what I now call “myself”. My grandfather would also go on for hours talking about things about to be forgotten by the world, toward the end of his life, but that was mainly of his own volition. I think I asked him once about some local legend as part of my school work, and after that he might have gotten the idea that I was interested in the past. And it is not like I stopped him. I have forgotten the names of everyone who was not a relative though. What I did learn was that a more primitive time, with reckless drinking and fighting, was not far in the past. Of course, for some of my classmates it was soon to be in their present. It was a crude part of a poor country back then. Oh how things have changed.